Background: Cistus genus is widespread in the Mediterranean regions with several species and is traditionally known as a natural remedy, but few previous phytochemical researches have been conducted on Cistus species growing in Sardinia. The aim of this study is to characterize the phenolic composition and to evaluate antimicrobial activities of the extracts of C. creticus subspecies growing in Sardinia. Methods: The fresh aerial parts of the plants were extracted using acidified methanol. HPLC-DADESI- MS was employed to identify the polyphenols in the obtained extracts. Antimicrobial activity was determined as Minimum Inhibitory Concentration by using an agar macrodilution method. Results: The obtained results allowed the detection of 52 phenolic compounds including phenolic acids, monomeric and dimeric flavan-3-ols, flavonol glycosides. The phenolic profiles of the three subspecies were observed to be similar, even if the relative percentages were quite different. The extracts did not exhibit any pronounced differences in their antimicrobial activities; however, it was revealed that Gram-positive bacteria are more sensitive to the Cistus extracts than Gram-negative bacteria. None of the extracts showed any noticeable action against Candida species. Conclusion: We can affirm that some differences are evident between the chemical profile of polyphenols in the C. creticus subsp. creticus and the other two subspecies; however, it appears to be clear that the secondary metabolites are similar. 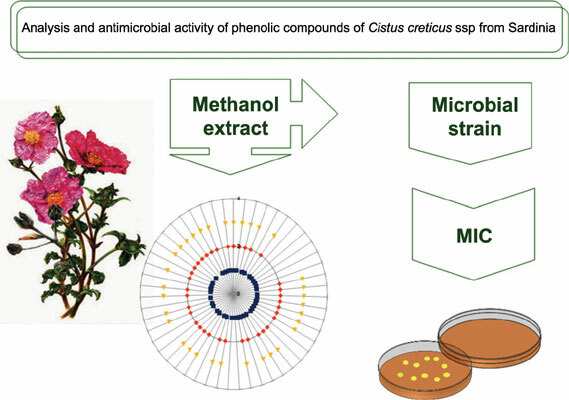 The present study permits us to obtain preliminary information on the antibacterial and antifungal activity of methanol extracts of Cistus creticus subspecies from Sardinia. Sardinia, Cistus creticus subspecies, phenolic extracts, HPLC/MS, antibacterial activity, antifungal activity.